EMA stands for exponential moving average which places more weight on near term prices. The S&P 500 Index has rallied substantially since Trump won the election. This is part 2 in a two part series on valuation, you can read part 1 here. Last week we took a look at a few measures of valuation. We looked at the earnings yield of the S&P 500 and saw that stock prices have been increasing much faster than earnings in the last several years. We also know that the fed has started raising interest rates and we saw that the spread between the earnings yield of the S&P 500 and the 10-year treasury bond has been narrowing. This week we will look at earnings, taxes, technicals, inflation and the fed to help us understand what to expect in terms of valuation. While price has outpaced earnings recently it is worth noting that we have seen some positive developments in earnings recently. In the last two quarters (Q3 2016 and Q4 2016) the S&P 500 has shown year-over-year growth from last year’s quarters. This would be the first time that this has happened since Q4 2014 and Q1 2015. However, earnings estimates have declined in the first two months of Q1 2017 while stock prices have increased significantly over that same time period. This pattern has not been unusual and has been characteristic of the recovery since the last recession. Perhaps we shouldn’t look at the near term though, since much of the recent bull thesis in stocks has been centered around the idea of tax cuts. Taxes certainly have a major impact on the valuation of stocks and it is perfectly rational to assume that a decrease in taxes would lead to an increase in the earnings of stocks. A tax cut for consumers, especially in the lower and middle income brackets would increase consumer spending and would generally benefit corporate earnings. Additionally, a cut to corporate taxes would have a direct impact on the bottom line of businesses; if corporate taxes decline, that extra cash can either be reinvested in the business or returned to shareholders. The big question is when will we see more detail on the tax plan. Trump recently said, “We’re going to … lower the overall tax burden on American businesses big-league. That’s coming along very well. We’re way ahead of schedule, I believe. We’re going to be announcing something, I would say, over the next two or three weeks.” That was over three weeks ago and was somewhat contradicted by congressional Republicans, but there will almost certainly be some sort of tax proposal this year. Of course, it could take some time before it goes into effect. A general rule of investing is to buy the rumor and sell the news. In this case, I think it is very possible that market participants are overestimating the size of the tax cuts and could be in for disappointment it is revealed. The S&P 500 index has not had a 1% decline in the last 98 trading days. That is the longest streak since 1995. The longest streak without a 1% decline was 154 days back in 1963. 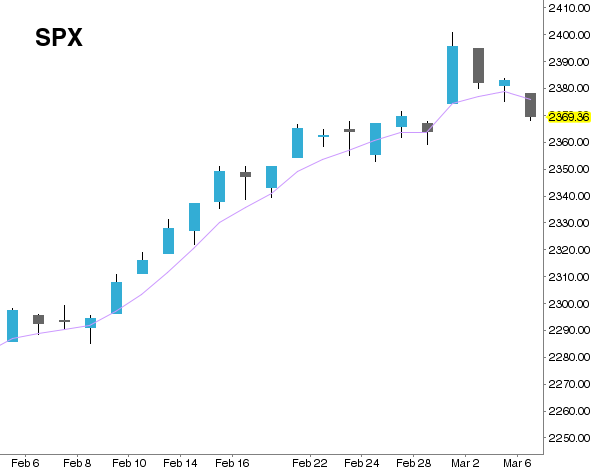 The S&P 500 has impressively spent the last 20 days above its 5 day exponential moving average, although so far it looks like that streak may break today (see figure 1). Stocks have been extremely strong since the election and most impressively have not even had a modest pullback. Figure 2 Shows the S&P 500 since the election. In the event that we begin to see above trend inflation stocks would be more attractive relative to bonds. Stocks are a great hedge against inflation not only because companies are able to adjust their prices to keep up with changing inflation, but companies with a lot of debt will find the burden to be more manageable because they are paying them back with cheaper dollars. According to the most recent fed minutes, “The staff continued to project that inflation would increase over the next several years, as food and energy prices, along with the prices of non-energy imports, were expected to begin steadily rising either this year or next.” Higher inflation expectations means that the fed will be more inclined to raise interest rates which could help make bonds more attractive relative to stocks, especially if inflation is lower than expected. It would be a great tragedy if you read this far and I didn’t offer my opinion on whether or not we are overvalued, so here it is: Yes. I think stocks are somewhat overvalued. However, I should also clarify that I don’t think we are going to have a long term correction just yet. I think that the current market situation is best handled by being overweight value vs. growth in stocks and being broadly diversified among other assets while holding more cash than usual, especially if stocks continue to rise without a corresponding increase in earnings or earnings expectations. I also, think that caution should be increased when below certain exponential moving averages and decreased when above. It has been eight years to the day since the S&P 500 bottomed at 666 and is now in the 2300s near all time highs and I think we closer to the end than the beginning of the bull market. So to be clear, I’m not calling a top, but calling for caution.